Central serous retinopathy (CSR) is a retinal condition that affects young to middle-aged people with no previous signs or symptoms of retinal disease. The average age of onset is the mid-30s, but it ranges from the late 20s to late 50s. It seems to affect more males than females by a 10 to 1 ratio, and more Caucasians than any other race. Interestingly, it seems to affect people with type-A personalities, too. People with CSR tend to complain of blurry or distorted central vision, usually in one eye. It can affect both eyes, but this is rare. People who develop CSR sometimes become temporarily far-sighted, and they may complain of straight lines appearing distorted or bent. CSR is sometimes referred to as "idiopathic" serous chorioretinopathy because the direct cause is not known. There is a lot of controversy in the medical community as to why some people develop the disease; a common recurring theme seems to be stress, and the condition seems to occur when stress levels are high in a person's life. Also, people who take oral steroids are at a slightly higher risk of developing the disease. Lack of sleep also seems to play a role. The condition begins between two layers of the eye. The photoreceptor layer of the retina lies above the choroid, a layer that functions to nourish the retina. Between the choroid and the photoreceptor layer is a layer of retinal pigment epithelial cells, referred to as the RPE. The RPE layer controls the flow of nutrients and fluid into the retina. When a person develops CSR, the RPE is affected in the macular region of the retina. The macula is a very specialized part of the central retina that gives us clear, acute central vision. Normal RPE cells have very tight junctions; these tight bonds prevent leakage of fluid. In CSR, something happens to allow these junctions to loosen and break down, allowing fluid to leak out. More cells break down, and the RPE layer actually detaches to form a small cyst in the area of the macula. The cyst changes the shape of the retina (similar to bending film in a camera) and distorts vision. Ophthalmoscopy: Eye doctors use a variety of methods to look at the inside of the eye. This may or may not include special meditational dilating eye drops to enlarge the pupil so the doctor can more easily examine the inside of the eye. Usually, a cyst or bubble of tissue can be seen. Optical coherence tomography (OCT): OCT uses light to visualize the different layers of the retina. This test gives the doctor a very detailed view to see if real fluid leakage exists. The test is painless, quick and usually requires no drops to be instilled into the eye. Fluorescein angiography: Doctors will sometimes use a method of injecting a special dye into the bloodstream, then photograph the circulation of this dye within the eye. Laser photocoagulation: Photocoagulation is a process where the doctor applies a thermal laser to the area of fluid. The laser will cause a very mild, beneficial scar formation in the pigment epithelial cells, halting the fluid leakage. Photodynamic Therapy (PDT): PDT uses a certain wavelength of light along with a certain photoactive chemical, called Visudyne, to reduce the fluid leakage and protect against the development of more severe forms of the disease. 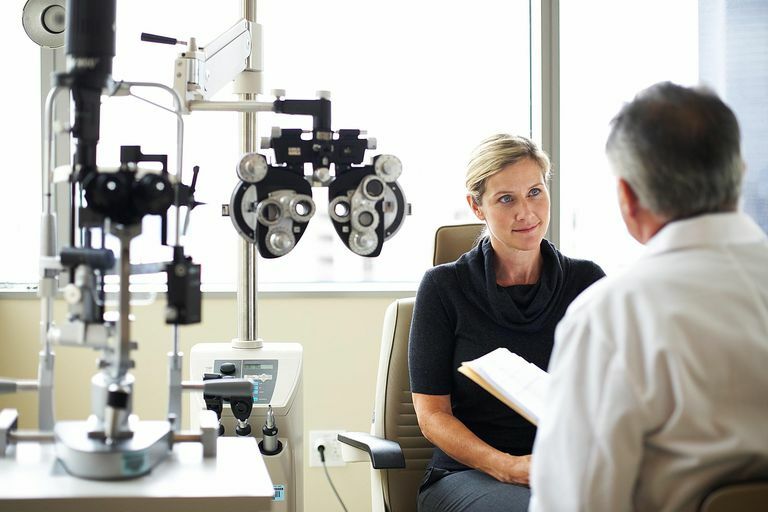 Although central serous retinopathy can be detrimental to your vision, most people have a relatively good prognosis with no treatment at all. A high percentage of people recover vision to at least 20/20-20/40 within 1-6 months. Sometimes they still have some remaining distortion of vision, but it is very mild. If CSR does not heal within 6 months, most physicians will consider treatment. Rarely, a serious complication can develop when blood vessels from the choroid begin to grow into space under the retina. Scar tissue may form, which could cause significant vision loss if left untreated. Alexander, Larry J. Primary Care of the Posterior Segment, Second Edition. Appleton & Lange, 1994. How Are Angioid Streaks Eye Condition Treated?